February 17, 2017 — The Food and Drug Administration is advising pet owners not to feed their dogs certain lots of Evanger’s Hunk of Beef or Against the Grain Grain Free Pulled Beef with Gravy canned dog foods after they were found to contain pentobarbital. Pentobarbital is a drug that’s used in animal euthanasia and should not be found in pet food. The drug’s presence in these products as detected by the FDA renders them adulterated. The FDA was unable to determine from available records whether any other Evanger’s or Against the Grain products made with beef contain any of the beef that went into the recalled products. Additionally, the agency concluded an inspection of the manufacturing facilities on February 14, 2017, and noted numerous significant concerns with conditions found at both the Wheeling, IL and Markham, IL plants. These are initial observations and do not represent a final agency determination regarding the firm. 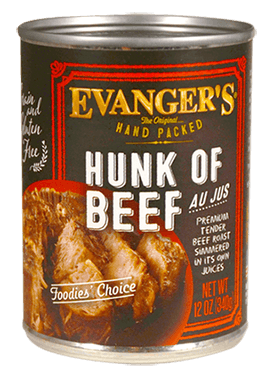 Following discussions with the FDA, Evanger’s initiated a voluntary recall on February 3, 2017, of certain lots of its 12-ounce Hunk of Beef canned dog food: 1816E03HB, 1816E04HB, 1816E06HB, 1816E07HB, and 1816E13HB, all with an expiration date of June 2020. 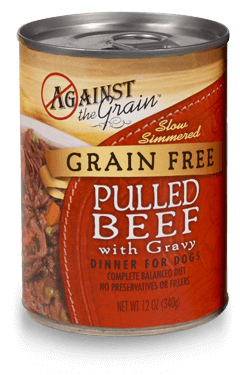 In the course of the investigation, the FDA tested two cans of Against the Grain brand canned Grain Free Pulled Beef with Gravy dog food manufactured in the same facilities as Evanger’s products and using beef from the same supplier: these samples also tested positive for pentobarbital. On February 9, 2017, after conversations with the FDA, Against the Grain voluntarily recalled lot 2415E01ATB12 BEST DEC 2019 of this product. The company issued a public notice about its recall on February 13, 2017. To date, the FDA is not aware of any pet illnesses associated with the Against the Grain product. The FDA began investigating Evanger’s Dog & Cat Food Company Inc. when it learned about five dogs in a single household that suffered acute neurological symptoms shortly after eating the product. One dog was euthanized after secondary complications, and three others recovered after receiving veterinary care. One of the dogs treated remains on seizure medication, and the fifth dog that ate the least amount of food recovered with time. The stomach contents of the deceased dog and an open can of the product were tested by an FDA Veterinary Laboratory Investigation and Response Network lab, and unopened cans of the product from the pet owner and retailer that sold the products (from the same production lot), were tested by FDA’s lab. All of the samples tested positive for pentobarbital. In its recent press release announcing a limited product recall, Evanger’s Dog & Cat Food Company, Inc. stated that the beef for its Hunk of Beef product came from a “USDA approved” supplier. However, the FDA reviewed a bill of lading from Evanger’s supplier of “Inedible Hand Deboned Beef – For Pet Food Use Only. Not Fit For Human Consumption” and determined that the supplier’s facility does not have a grant of inspection from the United States Department of Agriculture’s Food Safety and Inspection Service. The meat products from this supplier do not bear the USDA inspection mark and would not be considered human grade. USDA-FSIS regulates slaughter of animals for human consumption only. Testing by USDA-FSIS of Evanger’s Hunk of Beef confirmed that the meat used in the product was bovine (beef). The investigation by the FDA is ongoing and includes examination of the suppliers of beef to Evanger’s and Against the Grain to determine a possible cause for the presence of pentobarbital. The FDA is also coordinating with the USDA to address any possible areas of shared jurisdiction at the suppliers. Oral exposure to pentobarbital can cause drowsiness, dizziness, excitement, loss of balance, nausea, nystagmus (eyes moving back and forth in a jerky manner), inability to stand, coma and death. Consumers who notice these symptoms in their pets should consult their veterinarian. Consumers with cans of product subject to the facilities’ voluntary recalls should refer to the firms’ respective press releases for information about returning the product.